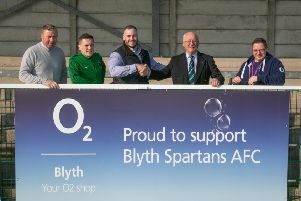 Having watched his side register their seventh consecutive success with a 5-0 drubbing of Ilkeston FC on Saturday, Blyth Spartans manager Alun Armstrong said he is far from getting sick of seeing his side winning with ease. Jarrett Rivers grabbed a brace either side of a majestic half-volley from Spartans skipper Robert Dale before substitutes Adam Wrightson and Daniel Maguire both struck within seven minutes of the pair being introduced as Blyth extended their lead at the top of the table to nine points. And, following a 7-1 demolition of Mickleover Sports and 4-1 triumphs over both Skelmersdale United and Matlock Town, Armstrong was thrilled to see his side dominate yet another Evo-Stik Premier League side on their way to continuing their 100 per cent winning record in 2017. The 41-year-old said: “You never get sick of big wins like we’ve had recently and the great feeling that they bring. In fairness, it could have even been by a lot more. “Ilkeston never stopped working, they ran their socks off and made the lads work hard for the result. We thoroughly deserved it, but it’s probably a little disappointing that we didn’t get a few more. “The pitch was really difficult as it was sandy, muddy and horrible. We had a few more chances towards the end, but you can’t keep pushing them. Blyth have struggled somewhat to assert their authority on proceedings early on so far this season, but that was not the case at the weekend as Rivers diverted a looping header past the hand of Ilkeston goalkeeper Dale Eve within the first five minutes, much to the delight of his boss. Armstrong said: “We said in the changing room before the game that Ilkeston would be right up for it as they have only been losing by the odd goal in the run-up to our visit. So, we had to make sure we started well. “I knew that if we started well and got a goal early on it would put them on the back foot straight away. Fortunately enough, the last person I ever expected to head it did so brilliantly and Jarrett put us in the driving seat straight away. Despite having to wait until two minutes before the break to double their lead, Spartans’ second was worth the entry fee alone as captain fantastic Dale caught Ilkeston cold when he unleashed an unbelievable effort from 25 yards which deceived Eve and went in off the woodwork. Armstrong said: “I was speaking to Daz [Darren Holloway] at 1-0 and I said that we just needed something different as it’s just not happening for us, and then Robbie goes and scores a wonder goal. “As soon as he hit it we could see that it was bending away and it was just typical Robbie really. “He just comes up with something different when you need it and he just keeps continuing to do that. Dale had earned a start against the Robins after he produced a match-winning display from the bench against Matlock and Armstrong kept up his impressive nous for substitutions on 60 minutes when a double change saw Wrightson and Maguire paired up top as the pair both found the back of the net within seven minutes of coming on. “I’m delighted with all of our substitutions at the moment as they seem to be working really well,” Armstrong admitted. “We bring someone on and something always happens, whether they create a goal or score one. “If you look at the strength we have in the squad attacking wise, it doesn’t surprise me. It’s really hard to drop lads, but they’re all playing well. “Luke [Armstrong] did everything but score before he came off, then Wrighty scores with his first touch of the game. That’s the way football is. “Then ‘Nipa’ [Maguire] got his goal not long after and I was chuffed to bits for him. “He wanted to start the game, as he always does, but I was looking at the game on Tuesday. After picking up a maximum 21 points from their seven games in 2017, Blyth have pulled away from the chasing pack at the top of the Evo-Stik Premier League. However, despite enjoying an eight-point cushion to the club’s closest challengers, Armstrong said he is not focusing on the table too much just yet. When asked how he felt about Spartans increasing their lead at the top, Armstrong replied: “It’s not that I keep an eye on the table, it’s that people keep telling me. We can’t do anything about it and we’re up there to be shot at. “Any game now could be a banana skin for us, so we just have to keep doing what we’re doing. If we can keep winning our games, then we’ll see where that takes us. Armstrong has made quite the impression since taking to the home dugout at Croft Park back in September, but one blot on his first managerial role was a 3-0 home defeat to Warrington Town in just his second game in change. A trip to the league’s 13th-placed side on Tuesday night gives him the opportunity to exact some revenge and the Blyth gaffer revealed he is more than ready to ensure that happens. He said: “I had a chat about the home defeat to Warrington and we owe them one, massively. “Te lads know that and everyone knows what happened during the game and the aftermath that followed [regarding his post-match comments on the result]. “The lads have recovered massively from that result and it’s really surprised me as to just how well we have done since then. “We’ve strengthened our squad since then, so it will be a totally different team that faces Warrington and I think they’ll be in for a little bit of a surprise. “We just have to keep doing what we’re doing though. Move the ball quickly, work hard and just attack with real purpose and pace.